The Challenge Program is a week long summer program that provides students in grades K-12 with a pre-college academic experience. Operated by the Saint Vincent College Education Department, 5 - 12 grade students stay on campus at Saint Vincent College for one week. Students participate in fun, enriched classes, elective activities, and planned evening events. The program slated for the Summer of 2016 has a unique "Galaxy" theme that lovers of the Star Wars series will find incorporated into the fun events, classes and activities to enhance this exciting educational opportunity. Please note we are not associated with the Star Wars franchise and they are not responsible for this program. 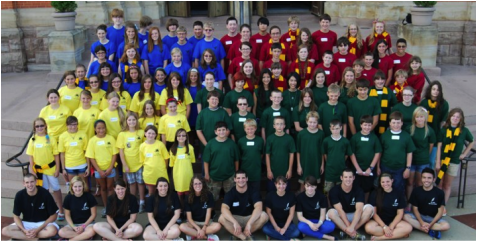 The Challenge Program has been held for over 30 years at Saint Vincent College. Click HERE for more information. During the spring and fall semesters, home-schooled and home study students from local communities participate in the Step-Up Enrichment Program. The one-hour enrichment courses are held in various locations on the campus of Saint Vincent College every Friday afternoon. These courses are designed and taught by college students who are enrolled in the teacher certification program. Classes are offered from Preschool through Grade Twelve. Click HERE for more information.